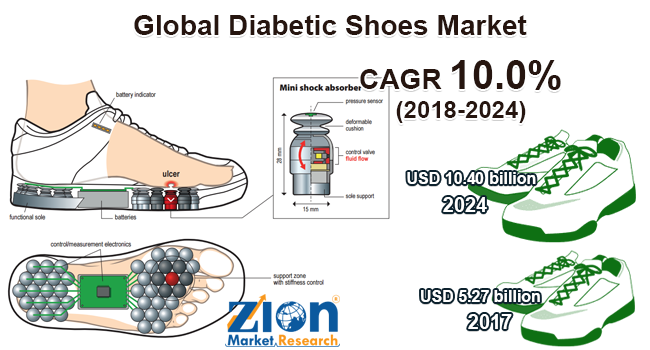 Global diabetic shoes market expected to reach approximately USD 10.40 billion by 2024, growing at a CAGR of around 10.0% between 2018 and 2024. Diabetic shoes are also recognized as therapeutic shoes which are specially designed for diabetic patients to reduce the health risk associated problems in diabetes. The report covers forecast and analysis for the diabetic shoes market on a global and regional level. The study provides historic data for 2015, 2016, and 2017 along with a forecast from 2018 to 2024 based on revenue (USD Billion). The study includes drivers and restraints for the diabetic shoes market along with the impact they have on the demand over the forecast period. Additionally, the report includes the study of opportunities and threats to diabetic shoes market on a global level. To understand the competitive landscape in the market, an analysis of Porter’s Five Forces model for the diabetic shoes market has also been included. The study encompasses a market attractiveness analysis, wherein the distribution channel, and end-use segments are benchmarked based on their market size, growth rate, and general attractiveness. The study provides a decisive view of the diabetic shoes market by segmenting the market based on distribution channel, end use, and regions. All the segments have been analyzed based on present and future trends and the market is estimated from 2018 to 2024. Based on the distribution channel, the market is segmented into online and offline. Based on end use, the market is segmented into men, women, and children. The regional segmentation includes the current and forecast demand for North America, Europe, Asia Pacific, and Rest of World with its further division into major countries including the U.S., Germany, France, UK, China, Japan, India, and Brazil. Diabetes mellitus is a chronic disease caused by acquired or inherited a deficiency in the production of insulin by the pancreas. Diabetes is classified as gestational diabetes, type 1, and type 2. Among of, type 2 diabetes is most common and is caused due to the reduction in physical activity, and obesity. A person suffering from diabetes develops several complications such as ulcers, sores, loss of sensation in body parts, abscesses, and predominantly in feet. Therefore, the special design of diabetic shoes helps to protect the patient’s feet from any injuries. According to the World Health Organization (WHO), as of now, around 150 million people have diabetes mellitus across the world and by 2025; this estimated number may well double. Hence, this data represents the rising prevalence of diabetes mellitus across the globe indicating the need for diabetic shoes, in turn, contributing to the growth of the global diabetic shoe market during the forecast period. Exceptional properties of diabetic shoe aid to cure several types of the diabetic condition such as insufficient blood circulation in body parts especially in legs, thus, it facilitates foot pain and ulcers. The primary reason behind the growth of the diabetic shoes market is the busy lifestyle of urban people along with increased ingestion of sugar and other synthetic sweeteners. Likewise, growing geriatric population results in high incidence of diabetes, increasing cases of diabetes, and rising spending on diabetes treatment is expected to fuel the global market of diabetic shoes over the forecast period. However, the expensive price of the diabetic shoe may restrain the global market growth. The global market of the diabetic shoes is segmented into the distribution channel and end user. By distribution channel, the global market is divided into online and offline. Among which, the online distribution channel is expected to attain the largest market share during the forecast period. This growth is attributed towards the rising online shopping portals with a variety of diabetic footwear. These online portals offer easy access to a range of brands and shoe type for the users. Based on the end user, the global market is categorized into men, women, and children. Among which, men are expected to attain the largest market share owing to the fact that, men are more prone to have diabetes compared to women and need to put on far less weight than women to develop the disease according to the report of National Health Service. By geography, the global diabetic shoes market finds its market scope in Europe, North America, Latin America, Asia Pacific, and the Middle East & Africa. The Asia Pacific is the fastest growing region in the market owing to the fact like the huge prevalence of diabetes in this region coupled with the rising demographic population. The regional segmentation includes the current and forecast demand for North America, Europe, Asia Pacific, and Rest of World with its further bifurcation into major countries including the U.S., Germany, France, UK, China, Japan, India, and Brazil. The report also includes detailed profiles of key players such as Etonic Worldwide LLC, Podartis Srl., DARCO International Inc., Aetrex Worldwide Inc., Apex Foot Health Industries LLC, Dr. Comfort LLC, Advance Diabetic Solution, Dr. Zen Products, Inc., Drew Shoe Corporation, and Orthofeet Inc. The detailed description of players includes parameters such as company overview, financial overview, business strategies and recent developments of the company.